If you have a busy schedule, you'll find more than eight classes per day, Monday through Friday. Need to come in on your own? We have open gym all day. There are morning WODs and clinics on the weekends and child care. Beginning Monday 1/14/2019 we will be adding a 3:30 PM class for Monday, Tuesday, and Wednesday. Intro classes, by appointment, Wednesday, Thursday, and Friday @9:15am, and Tuesday Wednesday, and Thursday @4:30pm. Our CrossFit amenities are unmatched in Denver. Enjoy as many WODs as you want, along with any other Bladium group exercise classes. You can WOD and follow it with a yoga class. You might like to take a spin RPM class on your recovery day, or put on your dance moves at Body Jam class. No other CrossFit gym gives you so many WODs and exercise classes for your CrossFit dollars. 60000 square feet of private indoor space and another 10,000 square feet of outdoor, eight classes per day, child care, open gym all day, yoga, spin, remodeled locker rooms (with showers, steam room and sauna), lifting gym, and a bar! Contact Scott at (303) 320-3033 ext 1016, Crossfitinfo@bladium.com, or fill out the form below to schedule your free week session. Or simply come in and sign up at the front desk. Cancellations must be done in person by the last day of the month to avoid the next month's charges. Thank you for contacting Bladium Crossfit! 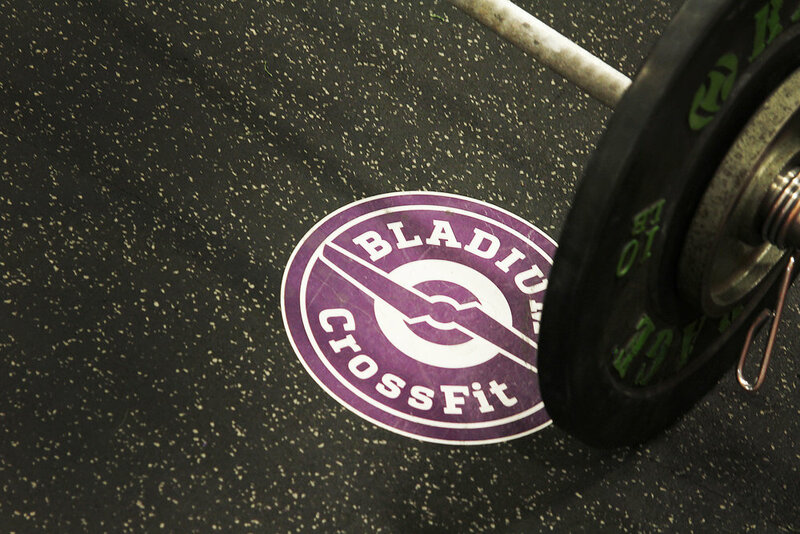 Bladium Sports & Fitness is thrilled to have Scott Olson as the CrossFit Manager. Scott is a six time CrossFit games competitor and three time gold medalist. His commitment to CrossFit translates directly into a training program appropriate for all athletes: beginners and competitors. His passion to help athletes succeed makes him the perfect fit as Coach and Manager. His expertise will take you to the next level. I 'found CrossFit' when I was assigned from patrol to the police academy as an instructor in 2009. I was the typical big arms/little legs cop. The Captain of the academy saw the arms and said, "You're a big guy. You're going to be in charge of fitness. Apparently we do this CrossFit thing so get certified." I coached everyone that walked into the academy for the next year, whether they wanted it or not, went to some more seminars then opened my own gym in 2010. I knew of, and respected, Scott Olson so in 2016 I joined Bladium CrossFit. Ethan, a native of Colorado, grew up playing Rugby, Ultimate Frisbee and chess. He enjoys coaching early morning classes and overhead squats. When not in the gym he stays busy running his small business and enjoys traveling to Mexico with his wife and four children. A few years ago while practicing Krav Maga, Michael started to look for a way to cross condition and improve overall strength, stamina, and flexibility. Starting with MMA inspired workouts he added yoga, bootcamp cardio and body weight workouts to my overall routine. In late 2010 he attended his first CrossFit class. Even though he could barely breath after the 12 minute workout, he was hooked. Based on his love for all things CrossFit he decided to become a CrossFit coach and share that passion with others who want to transform their lives and improve their fitness. Mel, a Denver native, grew up doing theatre and translated her flare for the dramatic to CrossFit in 2013. She has been coaching since 2015 and has placed in multiple local events in the Denver area. She also enjoys distance running, especially the Colfax marathon events. When not doing crossFit, she teaches middle school and enjoys reading, sewing, playwriting, and sampling fine wines. Jessica, a Colorado native, wife, and stay at home mother of two, was looking for a new challenge beyond the same old workout videos in her basement. In 2012, she walked into Bladium CrossFit, convinced it was not for her. Despite her reluctance, she quickly became addicted to the day to day challenges, rapid body transformation, and amazing community. In 2015 she took the Level 1 certification and started coaching. She loves sharing her passion for the sport and helping others reach their fullest potential. When not at the gym or chasing kids around, she enjoys skiing, golfing, and hiking. In 2016 at age 26, Jason weighed 65 more pounds. Motivated for change, he explored exercise as a healthier way to alleviate stress than eating pizza and drinking beer. Although he initially saw results, he struggled to find a program that didn’t get stale, and he struggled with low back and hip pain, which caused him to have long absences from the gym. Reaching his thirties, Jason believed that being somewhat over-weight, in pain, and being generally stressed-out was just part of getting older. Then, in 2013, Jason decided to take a friend’s advice and give this CrossFit thing a try. He was hesitant. He had pictured going to a gym where they just told him to throw a bunch of weight around and leaving on day one with debilitating back pain. To his surprise, he discovered a program that was welcoming to people of all fitness levels. He considers himself in better shape now than at any point in his twenties. After discovering what a truly remarkable and life changing program CrossFit is, Jason knew he had to give back to the community. To pursue this goal, he obtained his Level 1 CrossFit certificate in 2016. In 2013 when she had her son, Jackie started to go from chubby to “fat”. She and her husband went to Maui at the end of 2014 for New Year’s, and she couldn’t buckle the seat belt on the plane – getting bruises on her thighs from where the seat dug in. She weighed 310 lbs. After getting back, she evaluated what was important - being be able to play with Rainer, and walk up stairs without feeling like dying. Changes needed to be made: starting with changing her diet a little, and then let a friend talk me into trying CrossFit here at Bladium. She couldn’t do a full squat, let alone even knew what a burpee was and she’d never even touched a barbell before. Jackie fell in love with CrossFit, the community, the intensity, and the empowerment. CrossFit, coupled with solid nutrition, made it possible for Jackie to lose 120 lbs. Soon she realized that she needed to coach: to give back to the community that had given her so much, and to pass on the knowledge that fitness can be fun, nutrition doesn’t have to be a “diet”, and that your mindset is where everything begins. She’s excited to be coaching at Bladium, where it all started for her! Jackie no longer tries to blend in, but loudly and unapologetically his herself, and inspires others to do the same. She truly believes that fitness can help strengthen the mind, body, and soul, and is passionate about helping teenagers and adults unleash a great untapped power they hold inside themselves. My love for health and fitness started over the course of my military career. While serving overseas, I first experienced CrossFit on Bagram Air Base in Afghanistan. It was a whole different level of challenge for the body and mind that I never before experienced, and I was instantly hooked. Over the course of my military career I sustained a couple of minor injuries that have turned into the best gifts allowing me to develop greater techniques for recovery, mobility, and overall functionality. It is now my passion to teach others how to live healthy, happy, and fit lives. Outside of coaching I am a full-time student at CU Boulder studying physiology. My plan is to continue my education by applying for medical school in the next couple of years- ultimately I’d love to go on to complete a Phd and MD in neurology. I enjoy learning to the max and tell everyone I’m the coolest nerd you’ll ever meet. I listen to lots of Podcasts to discover esoteric and controversial topics that challenge and expand my own beliefs and consciousness. I’m an open book, please ask me anything! Look forward to helping everyone on their fitness journey! Contact Scott at (303) 320-3033 ext. 104 or CrossfitInfo@bladium.com to schedule your free week session. Check out our Facebook page for events, the WOD of the day, and other fun stuff. Tired of competing against the 20 somethings? Want to show off your skills and show "you still got it"? Sign Up Today! The 5th annual Fossil Games will take place August 18th, 2018 at Bladium Sports and Fitness. We're projected to have over 200 competitors likely to join the games this year! Don't miss the chance to participate in this amazing experience! The Fossil Games is for athletes 30 and older and offers two divisions: A team of 4 of 30-39 years of age, or a team of 4 of 40+. *Teams will be placed in the 30 - 39 division if any member is 30 - 39. Forty year old people may compete in the 30 - 39 category. All team members must meet the age requirement on event day. Teams are welcome to setup in the outdoor CrossFit area located along Central Park Blvd. Setup on the cement. The grassy area, and matted area are for WODs. The weights are the heaviest you can expect in a workout, unless it is a ladder or 1RM event. W1W2: 65 reps of bench press 75#, switching as necessary to accumulate 65 reps (no resting the bar on chest, rack, bench or anything). When W1 is working, W2 runs 150m. M1M2: act as rack for bench press as needed for the women, bar cannot touch the ground during the 65 reps.
After women accumulate 65 reps, men switch to bench press. M1M2: 65 reps of bench press 115#, switching as necessary to accumulate 65 reps (no resting the bar on chest, rack, bench or anything). When M1 is working, M2 runs 150m. W1W2: act as rack for bench press as needed for the men, bar cannot touch the ground during the 65 reps.
After men accumulate 65 bench press reps, team switches to bar facing burpees. W1W2: 65 reps of bar facing burpees, switching as necessary to accumulate 65 reps. When W1 is working, W2 runs 150m. M1M2: resting, and changing bar weight. Cannot change bar that is used for burpees. After women accumulate 65 reps, men switch to bar over burpees and women rest. M1M2: 65 reps of bar over burpees, switching as necessary to accumulate 65 reps. When W1 is working, W2 runs 150m. W1W2: resting, and changing bar weight. Cannot change bar that is used for burpees. M1M2: rest. cannot touch women's bar. W1W2: rest. cannot touch men's bar. Timer stops when men finish 65 reps of lunges and the runner is back. If lifting partner stops at 65 reps he/she will have to run a 150 while the other finishes the last rep. If team member rests bar on chest, rack, bench or anything during press, that set is done and partners must switch. Person can rest in the arm extended position. If pressing partner stops/rests before running partner returns, that set is done. *If bar touches the ground during a 65 rep set of lunges, there is a 3 sychro burpee penalty. Men work as partners. Women work as partners. Only one partner works at a time. The cluster can be broken down to a power clean, squat, and shoulder to overhead. The bar must start on the ground and all lifts must be touch and go. If the bar settles on the ground for a moment, including re-grip, partners will perform 3 synchronized burpees. Partners pass the bar to each other by any means, but it cannot touch the ground without 3 burpee penalty. The bar can touch the ground during transition. For example if there are 10 seconds left partners on the clusters and they set it down, to move to the pull ups, There is no burpee penalty and they are done with thier set of clusters. No more reps are accumulated. Partners must stay together at each station, even if they will not do any reps at station. Partition reps as desired. P4 pushes box to first yellow line, performs 9 box over burpees (step ups ok). Then push box back to starting line. P3 pushes box to first yellow line, performs 9 box over burpees (step ups ok). Then push box back to starting line. P3 pushes box to center white line, performs 6 box over burpees (step ups ok). Then push box back to starting line. P4 pushes box to center white line, performs 6 box over burpees (step ups ok). Then push box back to starting line. P3 pushes box to farthest yellow line, performs 3 box over burpees (step ups ok). Then push box back to starting line. P4 pushes box to farthest yellow line, performs 3 box over burpees (step ups ok). Then push box back to starting line. Clock stops when each partner does three rounds of box sled pushes with burpees and the partners together reach 2000 m on the rower. Tiebreaker is 2000m row time or if timed capped, the number of meters. Two female partners will start, one doing a max set* of shoulder to overhead, the other runs 150 m. When women partners complete 65 reps and runner has returned, the men will complete the same movement and pattern until they complete 65 reps. Women will continue the same pattern with hang cleans, followed by the men. Repeat again with front squats. Reps only count while partner is running. If partner lifting stops at 64 reps he or she will have to run a 150 while the other finishes the last rep. When all reps are completed and runner is back to starting position, your WOD is complete. *Max set means you cannot put the bar down. For shoulder to overhead the bar cannot go below your shoulders. For hang cleans the bar cannot go below your knees. For front squats the bar must stay in front rack. Scored as two WODs. There will be one score for bench, and another separate score for wall walks. Partner A presses, partner B spots lifter. Partner C hangs from bar and partner D hangs from one muscle up ring. Bench press repetitions are counted while partners C and D are hanging. There is a rack. Bar cannot touch the floor or the bench. Partition repetitions as desired in parts 1 and 2. Further flow and movement standards will be announced soon. Partners complete each movement simultaneously, once each partner completes their reps they perform the second movement. Partners cannot move on to next movement until both partners complete their reps.
Once partners A and B complete their 3 rounds they will tag off to partners C and D (Male/Female). 16 Kettle Bell (20/12 kg) Snatches+40' overhead walking lunge. Same as Part 1, both partners work simultaneously until reps are completed, then move on to next movement for 3 rounds. Score is total time worked. The Fossil Games sold out last year. Get after it! ©2018 Bladium Sports & Fitness Club. All rights reserved.